Yep, after getting delayed from last month, Nendoroid Petit Ikoku Meiro no Croisee set will be the first product to receive exact release date for this month. UPDATE: Nendoroid Azuki Miho, Cordelia Glauca, and Inui Sana‘s release dates. I’m waiting for Inui Sana! And isn’t Saber delayed to mid-June? Now that you mention it … yes, she is supposed to be delayed to June. I wrote the post based on GSC’s official listing, but I guess it has not been updated. I missed out on Kyoko, and I’m super bummed. 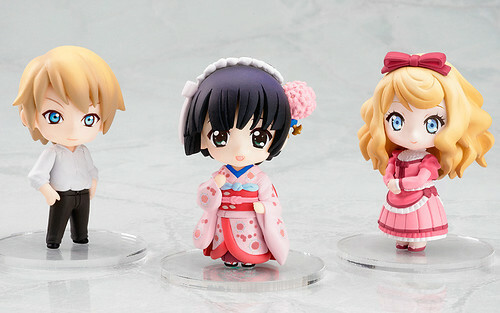 But I think I can (eventually) get a hold of all the Madoka nendos! Hi animaster! Turns out Nendoroid Kyouko Sakura will be released on April 15th! Working!! Sets A + B are also released on May 15th! Still waiting for Nendoroid Louise.